Vintage Recording Formats - audiotools.com. Here is a small section on outdated and unsupported recording formats, the motive for including them here is primarily with a view to the historical, nostalgic and archival value that the formats represent as none of them is practical for modern sound recording. 4 Track Cartridge, 8 Track Cartridge, DataPlay Discs, Dictaphone, Edison cylenders, Elcaset, IBM Magnabelt, Mail-A-Voice, One shot recorders, Pocket Rockers, The RCA Cassette, Wire Recorders, Pierce Wire-O-Matic. The wire recorder is a magnetic recorder and thus works on a similar princip as the modern analogue tape recorder but instead of a plastic or paper strip coated with ferric particles (i.e. rust) that a tape recorder of any type will use, the wire recorder records onto a metal wire, usually iron but steel wire was also used. It was invented in 1898 by the Danish engineer Valdimar Poulsen as the Telegraphone and was intended by him to be used as telephone answering machine but the technology turned out to have been way ahead of it's time and he had problems marketing the device as he had a difficulty in explaining the practical use of the device, but nonetheless some machines were manufactured under his auspices just after the turn of the century in Denmark and a decade later in the USA and actually sold reasonably as an office dictation machine. However after Poulsens patents ran out in the late 1910's, manufacturers in the USA and particularly in Germany started to manufacture recorders that were based on his invention but utilised technical improvements such as electronic amplification which allowed for slower recording speeds. But even though the recorders got quite a bit of publicity at the time it did not archive any real popularity until after the second world war partly due to the effects of the depression and partly due to initial disappointing sound quality which was greatly improved during WWII with the introduction of the AC bias. By that time however the technically superior Reel to Reel tape recorder was quickly establishing itself in the marketplace so the wire recorder was only really sold as a lower cost alternative to the open reel machines and fizzled out in or around 1950 except for the business dictation market were they survived into the early 60's and in very small way into the 70's. The wire recorders were mostly used as voice recording devices but saw quite some use in music recording particularly in home and hobby usage. Swedish company but this device was almost certainly either made n the UK or made there under license since all model Is have seen for sale were located there. Introduced their first wire recorder in late 1947 in the form of the 84U, it was intended for home usage and was designed in a similar form as tabletop radio's were at the time i.e., meant to stand permanently on a piece of furniture and featured a built in speaker, it was also designed in house in stark contrast to most other European brands of the day that sold re-badged American and German designs, the company did however relent in 1951 or 2 and released a recorder that used Webster spools using bought in parts. Introduced a cassette based wire recorder in 1945 that was available as an option in the more upmarket radiograms that the company manufactured, this was an endless loop system unlike most competing systems and while that had clear advantages for the consumer market it was not a success probably mostly due to media costs and reliability issues. The company gave in a later in the decade and introduced a more conventional open reel recording unit that was primarily sold as a optional unit for systems like the previous model but was also available as a standalone recorder. Made recorders in the early 50's that used Webster style wire spools but were allegedly developed and built in-house from top to bottom, unsure if the product was licensed or not, there is a picture of the Magnetica here. Started supplining the USA Air Force with wire recorders designed by Marvin Camras in 1941 and introduced a consumer model based around that design in 1945 as the Model 55B. This was a open reel design that did generate a lot of initial interest and sales but even though it had some competitive advantages over the opposition it vaned in popularity when cheaper alternatives appeared. See also Pierce Wire-O-Matic. A designed derived from the original military Pierce Wire Recorders, but this company was one of the original wartime subcontractors, this are simpler machines then the Pierce models and were much cheaper at the time in addition to having a much better distribution so WC quickly became by far the biggest maker of wire recorders, so the reels made by them became something of an informal standard and were used by quite a few other manufacturers (Not to mention that many other brands sold their recorders under their own name). They did have a reputation for tangling wires however. Despite having a cassette based format of their own (see below) RCA ignored it's potential as a car audio medium and instead repeatedly tried to market their 7" records as the format of choice for car audio, despite numerous technical and practical disadvantages. This oversight presented an opportunity for smaller players to get into the market and that is just what a used car salesman from California called Muntz did in the early 60's, he was fed up with trying to get the car record players of the day to work so he decided to look for something that worked better. He found an endless loop cartridge called Fidelipack that had been invented in the early 50's but had not been able to find a niche, and promptly bought the patents rights to it. The original cart had been a 4 track mono cart, Muntz kept the format but used it in a stereo configuration. The resulting product was called Muntz Stereo Pak and became wildly popular in the southern USA as a car audio product. You can still get blank Fidelipack carts in the USA, while they are not intended for use in 4 track recorders they apparently do work, possibly an adjustment to the bias circuit of the recorder is needed. William Lear who was one of the founders of Motorola and later founded Learjet came out with a minimally modified version of Muntz's cart, that had 8 tracks rather than 4 and had minor mechanical changes to the cartridge itself in order to circumvent the Fidelipack patents. As Motorola was the only supplier of car radios to Ford at the time Lear managed to get the company to offer his version of the cartridge player as an option on the 1966 models of Ford's, but despite that the Muntz version remained the more popular choice in the after-market and amongst software buyers right until the main Muntz factory was destroyed in a fire in 1967 (? ), and left Learjet as the only player in the market. The reason for this resistance to the 8 track was that the sound quality of it was actually inferior to the 4 track due to it's mechanical design, it had a only half the track width of the prior format, the head mechanism caused alignment problems but worst of all Bill Lear refused to switch to BASF tapes. The BASF company had in 1961 invented a greatly improved tape, both in mechanical and electrical specifications but it's use required minor electrical modifications to tape recorders to work, this invention was actually what spurned the designers at Philips and Grundig to invent the Compact Cassette and the Grundig Cassette. Despite pleas from Motorola Mr. Lear insisted that a much inferior older tape formulation from Ampex would be used, this was viewed as xenophobia by some at the time but with hindsight it appears that Ampex actually was an important backer of Lear and that probably had more to do with his decision. Quality 8-track recorders are difficult to come by, the better mechanisms were manufactured by Sanyo (also sold as Wollensak) and Akai Electric Co. (also sold as Roberts). Sony invented this format in the late seventies, intending to make an better sounding alternative to the Compact Cassette. The Elcaset itself was like a hybrid between a compact and a video cassette, the tape was drawn out of the cassette like a videocassette in order to eliminate the shell resonance's that were a problem with the Compact Cassette but in other respects is much like an oversized version of that format, it measures 15 x 10 x 2 cm and has a 6,3mm tape running at 9,5 cm. The recording format was 4+1 tracks, 2 on each side for audio like a cassette or a 4 track open reel with a thin extra track "for future use", probably intended for recording of timecode or automation information. However it turned out that the cassette format was too well entrenched for this new format to make a dent, and it was not helped by the fact that the machines were similar in price to an Reel to Reel but obviously lacked both the support and the versatility. Elcaset got Sony into a bit of trouble in Europe, while it was not a success globally it sold reasonably well in Germany and when the company dropped support for it in the early 80's there were complaints to the European Union trading standards office that meant that Sony was forced to keep supplying blank tapes well into the 90's, and indeed you can still get Elcaset blanks over there. For fore info on the format visit this page here or this site here (in German). Owners of the Sony EL-5 model should note that there is a hompage dedicated to that model including a downloadable service manual. Odd item this, called a Cartridge by RCA at the time but is actually a a 6,3mm 4 track tape Cassette that can only be described as an oversize Compact Cassette, remarkably similar in fact. Introduced by in ca 1957, mono versions of this unit sold well in the US as a cheap alternative to an open reel recorder, but the stereo version bombed mainly due to a rather indifferent sound quality at a time when Stereo was a byword for hi-fi. This meant that while sales of recorders were reasonable enough for the company to continue, the lack of software sales killed the format (RCA being a record company as well as a hardware one). Mono recorders of this type are common enough as to be semi worthless (but fun to own), I have been able to find at the least 1 item on sale at any given time on ebay, but the stereo versions are very hard to get hold of and seem to command fairly high prices, but since software for the format appears to have only been released for a couple of years or so and given that none are known to be unique to the format, this item remains a curiosity only. P.S. it's often stated that the name of the format is "Sound Tape", that's incorrect, that is simply the trademark that the company used for blank tape both before and after the introduction of the RCA cassette. Not strictly speaking a recording format but included here since it was a tape based. An attempt by Fisher Price to sell a new budget format tape to the teenage market in the latter half of the 80's, the tape was an endless loop 4 track Cartridge with max. playback time of around 15 min. or so. The idea was that this was more convenient than a cassingle both in features and in size (the player and in particular the tapes are tiny). The format appears to have only been sold in the USA (as with many audio products from the company) and while it sold reasonably well on account of it's budget price, not well enough to keep it on the market for more than a year, total number of titles released for the format were only around 40 or so and are an odd blend of 50's and 80's pop. You can find more info on the format on this fan page. This item was the first commercially viable recording format, but not the first one as is often stated. There is a fascinating page on modern cylinder phonographs done by s Swede called Christer Hamp, nb. these are phonographs so they will not record, if anyone has a link to a (good) generic page about cylinders please send us a line. One of the problems with cylinders was that it was difficult to mass produce pre-recorded units so most were recorded one at a time, with a good performer or a band managing to turn out 20 to 30 units a day. This means that if you find a early pre-recorded cylinder you are looking at a unique recording, there is in other words no other exact copy of it available, so take care of it! The Dictaphone was invented in the USA in the 1881 by Alexander Graham Bell, Chichester Bell and Charles Sumner Tainter and was intended to be a method of recording telephone converstions and to work as an answering machine, it's format is a cylinder broadly similar to the Edison cylenders and uses a similar hill and dale configuration. It was never sold for its original purpose butrather as a notation device for the business and educational markets, the cylinder was reusable and had a playback time longer than the Edison version. A small disk based recording device, broadly similar to a small portable turntable or a disk cutter but had a magnetic head instead of a pickup/cutterhead, the recording quality was pretty abysmal. Brush Development Company started manufacturing the device in 1946 and utilised 9" paper disks coated with magnetic particles developed by the company in association with 3M but actually manufactured by Shellmar. The disks and the coating were fairly rugged and paper was chosen instead of a more durable format because the idea was that you could mail it directly without packaging and the long term durability was not a problem since the format was intended for a dictation recording only (this idea resurfaced with dictation belts), but in the 50's disks made out of plastics were available. The unit was not a hit but sold reasonably due to the relatively low price of 40USD which made it one of the cheapest dictation products that you could buy at the time (there was in fact a cheaper model available, the 501), it can be seen in operation in at the least 2 Film Noir movies from the early 50, it died out sometime in the 50's primarily due to the fact that it was difficult to use compared to a tape recorder but there were also problems with lifetime of the magnetic heads, and it was a bit primitive, erasing was done by holding a permanent magnet over the disk. The Mail-A-Voice was manufactured under license by the British company Thermionic Products as the Recordon. These were used in some recording studios but mainly in radio stations to record announcements, automatic broadcasting and adverts, one offshoot of this technology was the echo machine. These recorders usually utilised some sort of a tape loops but other variants are known such as the Gates reel device mentioned here below. These were almost all conceived using property formats and have long since been replaced with digital technology since the instant or almost instant random access features of digital devices make them ideal for this sort of situation. As a specialised broadcast supplier it was one of the pioneers of this type of devices, the Oldradio site has a page that shows one or 2 types of their recorders. The shortest lived audio format that yours truly has been able to find since the only device that featured it was available for just a few months in 2002. Initially conceived in 1998 as a generic digital data storage device by a company later to be called DataPlay Inc., the media itself is a tiny CD like optical disk around the size of a small coin enclosed in a protective plastic shell, the disk is a dual sided WORM that supports approx. 250 MB per side. This is as you will probably notice in some way's an ideal miniaturised replacement for the venerable CD since it was much better suited for portable players being just a portion of their size (both the disk and the mechanism) and as most CD's out there are under 50 min (or can be made to be so) the they would fit onto a Dataplay disk in an unchanged form (i.e. uncompressed 44KHz 16bit PCM data). This meant that the format generated a large amount of interest amongst the larger USA based record companies and indeed the company showed a prototype audio player in the spring of 2001 alongside authorised pre-recorded media featuring popular American artists of the day, but this also meant that the media companies got their say in the definition of the format and since this was at the height of the Napster induced paranoia they demanded a secure version of the Dataplay disk which in turn demanded some sort of a digital rights management system. The Dataplay company settled on licensing the InterTrust DRM system and software which turn created format for personal audio devices that potentially supported uncompressed pre-recorded disks with security features, allowed for recording via analogue inputs using the same format but due to the inclusion of a DRM system approved by the larger recording companies opened up the possibility of an "officially sanctioned" compressed audio format, but with technologies such as MP3 500MB are enough to store up to 12 hours reasonable quality of audio. The only Dataplay products to have shipped as far as I am aware of are blank media produced by Imation, drive mechanisms that were shipped to developers (11x48x52 mm, 10MB/s TR and 2 MB buffer) and the iRiver iDP-100 MP3 player, that unit did at the time generate a lot of interest since it bought many of the advantages of HD MP3 jukeboxes at a price more in line with a normal Flash player (who were mostly 64MB or less at the time). It offered relatively cheap removable media and due to the small 3.3v motor the lithium-ion rechargeable battery had a usable life of 12 hours, much better than with the HD jukeboxes at the time, it has a reasonably fast USB 1.1 connection with a TR of 12MB pr. minute and was at the time considered to be one of the better sounding MP3 players out there. There were some problems however, the player was advertised as supporting a multitude of compressed audio formats including AAC, ASF, QDX and WMA but in actuality the IDP-100 only supported MP3, the Windows based FuturePlayer jukebox software that came with the player did support the other formats but that was not really the point, firmware upgrades were meant to become available that supported the other formats but as far as I know they never surfaced. Furthermore the Dataplay mechanism only supported the playback of music in the secure CK format (.ckmp3) which meant that you were forced to convert your existing files before sending them over and CK encoded files were supposed to be available for online purchase but that does not appear to have happened. It is unknown if the iDP-100 supported the playback of pre-recorded disks, it was said to do so in the original brochures but this is not mentioned in later press releases etc., it did not allow for the transfer of music data from the disk to computer (DRM remember), not even the music you recorded on the device but did allow for the transfer of other data so you could use the device as a generic USB storage device. Outside of that the iDP-100 was much bigger than it needed to be partly due to an admittedly really good and informative back lit LCD display, it also included the usual bass and treble boosts and an automatic fade in out. 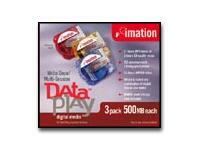 Imation discontinued the manufacture of Dataplay disks in the latter half of 2003 but when this was written (Dec. 2004) there seem to be plenty of them in the channel albeit rather expensive at USD 10+ a pop.